On Friday night I finally replaced the rear E-07 Dakar on the Tenere. To say that the Dakar version has impressed me is a bit of an understatement. This tyre has done just under 10,700km. The previous E-07 (not the Dakar version) did just under 9,000km and the one I replaced on the Vee made it to nearly 8,500km. 6,500km of this tyre's life was on last year's TT2000 trip where the bike was loaded up to the gunnels and hammered around the South Island on coarse chip and hard packed gravel roads. That remaining meat has meant that it's only just lately (in deep gravel) that the tyre has struggled. I had no problems on the Waikaremoana Road where things were a bit damp and sloppy in places. It was even still behaving on wet tar - perhaps traction control helps a little there. Anyway, fresh is best so after the usual wrestle, the new one is on and the bike is road legal with a WOF and everything! But hang on, what about the front you say? Well, it's still hanging in pretty damn well. 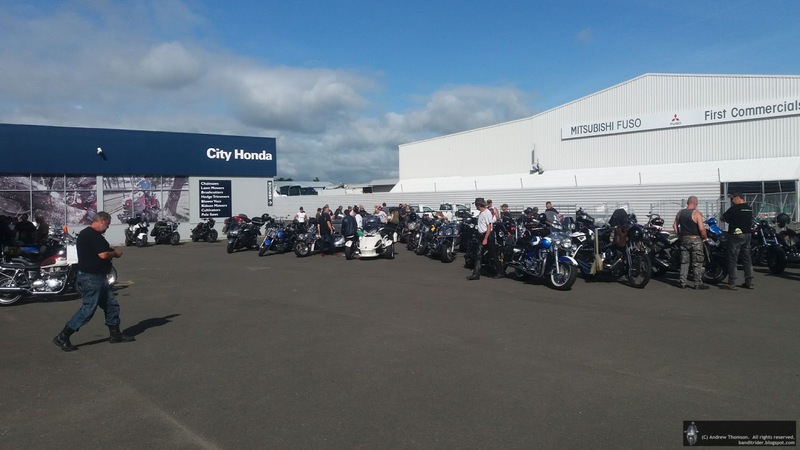 I arrived fairly early and signed on and spoke to a few riders while I waited in the hot sun. With a lot of agricultural equipment surrounding me I felt a little like the odd one out but hey, it was great that the ride was getting a good turn out. The photos below are pretty much before "everyone" arrived, I'd say that before we left there would easily have been 4-5 times as many bikes. After a desperate SOS text to James (Ok, so he was just running a little late) there was finally another quality machine in the line-up. 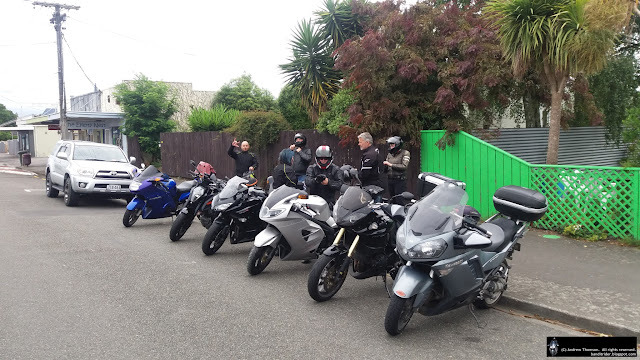 There was actually a fairly decent smattering of bikes: a gold-wing or 2 (one with a hound as co-pilot), some proper V-twins, learner bikes, a Vespa, a brace of 'busas and yeah, plenty of compressors. The lest said about the ride itself the better really - James and I pulled out when we hit Tiritea. The videos can speak for themselves - although I did not have the camera going when some of the worst of the riding was going on. There had been a number of emails from GoPro offering deals on cameras and I got a little twitchy. But then I noticed that they were still pretty dear. A wee browse on Trade Me brought up all sorts of things including a Garmin Virb Ultra 30. I'd played around using the Garmin Virb software a few times using GoPro footage and tracks from my Zumo to overlay data but it was a pretty tricky process matching the data to the video. Grabbing a Virb camera with its own GPS sounded like a much better idea. And second hand it was less than half new price and cheaper than a newer GoPro. And its got a screen - a touchscreen too! Different knobs on top. Flicking the lever on the right (and it worked with my gloves) starts the camera up and recording. Pressing it takes a photo. Time to mount it up and go for a ride. 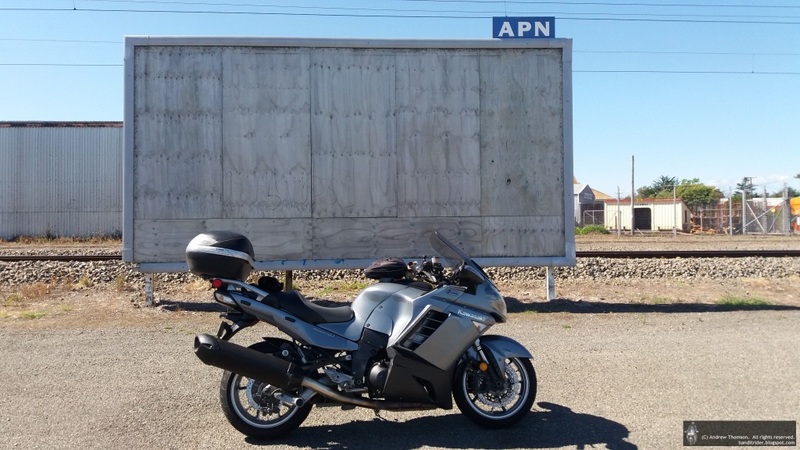 Ok, so I got it on the bike so it was time to test it. The camera is capable of 4K video but I don't have that fancy fast internet for uploading gigabytes of video so I recorded in 1080 and then after the Virb software created a huge file I processed it again down to a more manageable sized file in 720p. Not too bad eh? I'm a bit unimpressed with the interference at the start of the video where I give the Connie a couple of revs but I've had similar on other cameras - GoPro's seem to not have this problem. Anyway, just for a giggle here's a bit more video showing what it's like to ride the Saddle these days...far too many vehicles on my track...Some nice views though. Come Sunday, me, the Tenere and her bald rear tyre fuelled up in town and rode around to meet Colin where he was busy adjusting his chain (what's that?) on his shiny new Africa Twin. After a bit of ogling at bikes we got organised and Colin led the way out of town and up over the track. We made our way over to Pahiatua and then turned towards Mangatainoka but rather than terrorise the good people of Mangatainoka, we turned off to take a series of skinny (all sealed) back roads through to Oringi where we hooked a right on SH2 and followed this to Dannevirke. In Dannevirke, we turned onto the Weber road and took this as far as Mangahei Road. This led us on a great little cruise through some familiar countryside. Meanie, Monie, Rodney and I rode this in November as part of the C1K. The difference this time was dry roads so we could enjoy the scenery more without having to worry too much about the slippery road surface. A little further up the road we got off the C1K route and hit our first bit of gravel. Colin got away on me a little here as there was a bit of gravel on the road and my rear was giving me a little bit of trouble in the slower stuff - locking up a little easily and generally slithering around a bit. Coming off the gravel I had a close encounter of the avian type. Not sure what he was up to - he should have been 100m further up the road where three rabbits ran across the road in front of us. Perhaps he had already had his elevenses? More sealed roads kept us heading generally Eastwards to our lunch stop in Porangahau but before we got there we got to take in Old Hill Road. This is gravel most of the way and is really worth the ride. You get taken up reasonably high and get spectacular views of the countryside and out towards the Coast. Unfortunately the GoPro cannot swivel on it's mount to snap these views but here are some of the best bits. 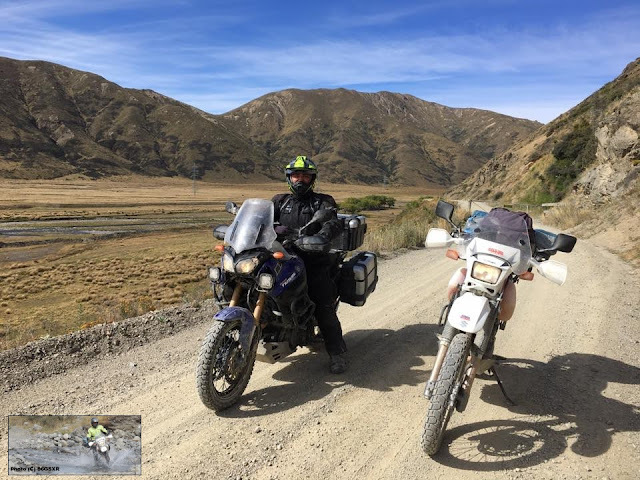 And here's a few pics from another day when the Connie clambered up the sealed section of the road just above Porangahau. Dropping down the hill we hit Porangahau and pulled into the pub for a really nice fish and chip meal. We couldn't sit around forever so after packing away our greasies we remounted and headed South on Route 52. We rocked and rolled our way back through Wimbledon until we hit the Akitio turn-off. 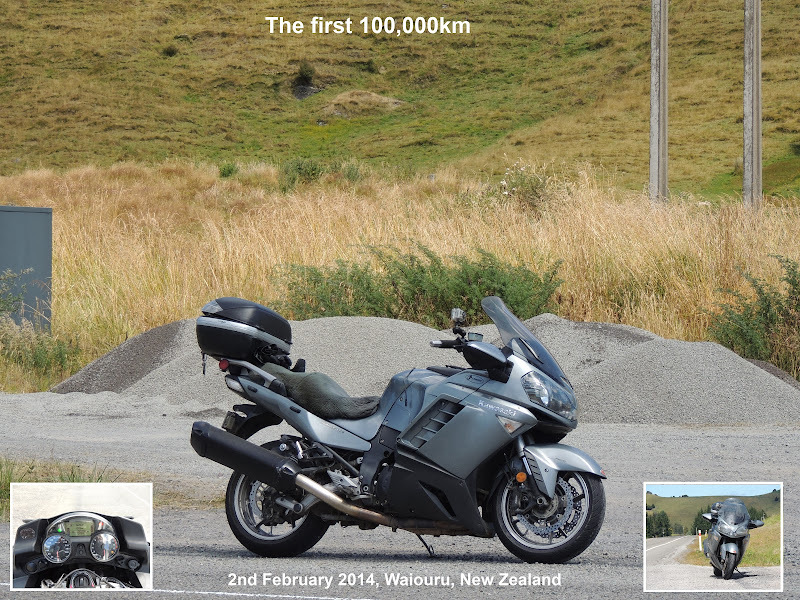 Rather than make for Akitio we turned up Waione-Horoeka Road which heads towards the Wahi Falls. But instead of going to the falls we turned off on Towai Road which climbs up on top of the ranges for a another great view in all directions. It can get pretty windy up there (the GPS said 600m where we stopped just below the summit) but not on this day. Well, it's January again so perhaps it's time to look back on 2017 and see if I managed to eke out enough fun from it. 2017 seemed to be a pretty crap year weather wise. We had a lot of rain and some pretty miserable conditions at times. I'm not sure if this is the best (or even most likely) excuse but, this year I've only done just over 16,000km across both bikes - with the Tenere stealing the lion's share of the riding. Feb turned into one of the most enjoyable of the year. First up, I started getting queries from a certain Aussie Blogger who was threatening to come over and visit. 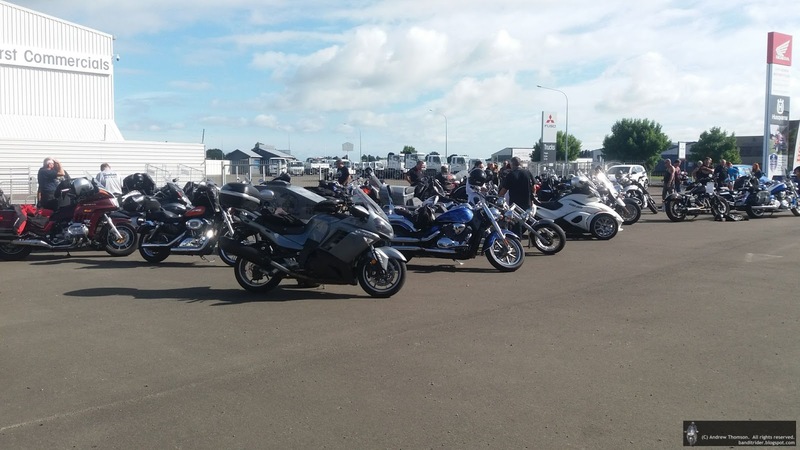 And then, horror of horror, poor little old Palmerston North was invaded with not one but four crazy Aussies on there dubious rental bikes! All joking aside, this really was a fantastic experience and they weren't really that bad...It also was great to have met the guys through the world of blogging - see someone does read this blog! Bushpig: Triumphs are great I tell ya! 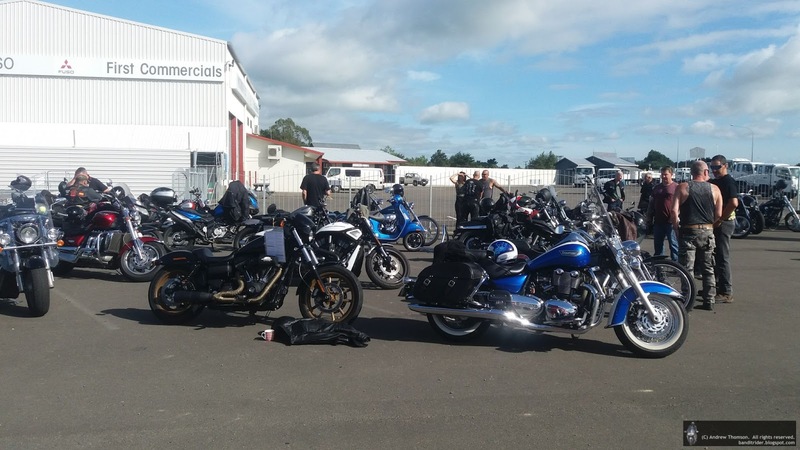 And then, no sooner than the Black Pearl had departed the Manawatu, the Tenere was pointed South for my annual trip for the TT2000. This time around though, I was on an Adv bike and was able to spend plenty of time before and after the TT cruising some fantastic gravel roads and crossing off some of the iconic Adv rides like The Molesworth, The Rainbow, Hakataramea and many more - nearly two weeks and 6,500km of fun, fun, fun! Reviewing the blogs for March and it looks like I was still getting over the TT with a bucket load of posts related to the TT. At least the Connie got to go out for a quick tag. Man, what did I do in April? Well, not much by the looks. 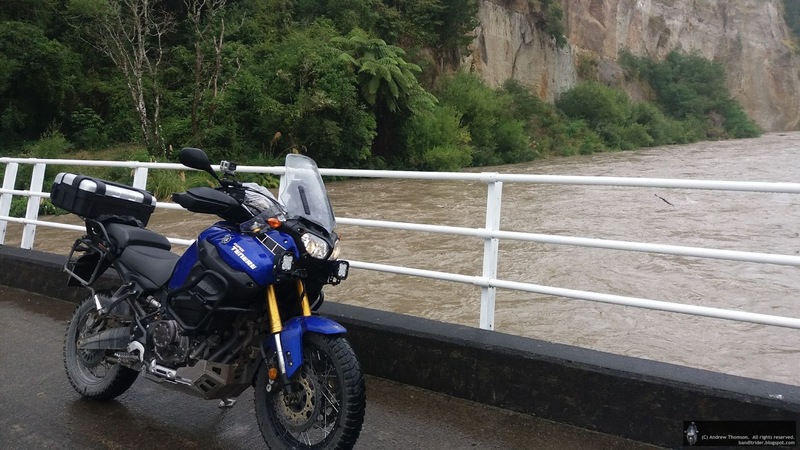 At least the Tenere got some exercise. 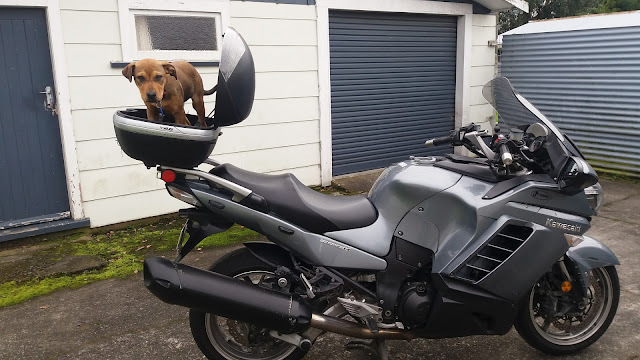 Touch Dad's bike and you're dinner! 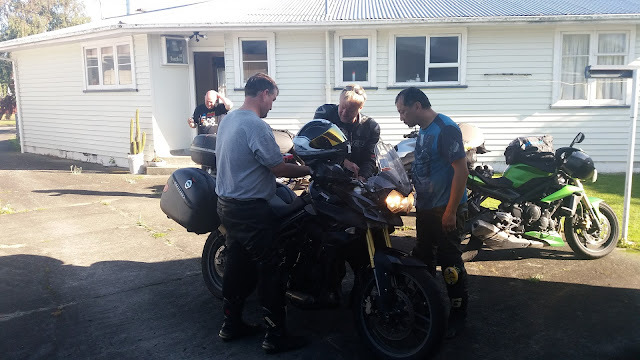 The Tenere did get in at least one ride worth blogging about but the Connie also got her battery charged with a nice ride to Ohingaiti. Pretty girl was my comment back then - and it still fits! In June there seemed to be a bit more action. The Connie visited a favourite road of mine on a particularly crappy winter's day. Pretty girl in pretty scenery. And I joined a bunch of like-minded nutters on the TSS Red Baron Adventure ride. In August we had a cold snap that dropped snow down low, but a week later there was very little left of it on Whariti. And, there was cause for much celebration when my beloved celebrated a milestone. Present for the bike or me? 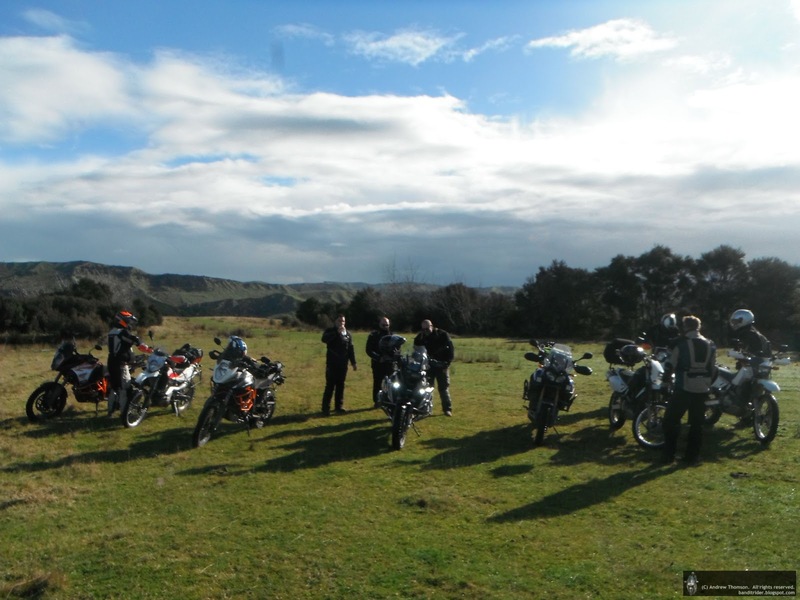 But later in the month the Tenere got to climb Burma Hill and revisit the Turakina Valley. In November it was time for another good day out on the Connie. And I took Rodney for a ride through the not so bad, Badlands. In December the Connie got to do one half of the Coast to Coast. 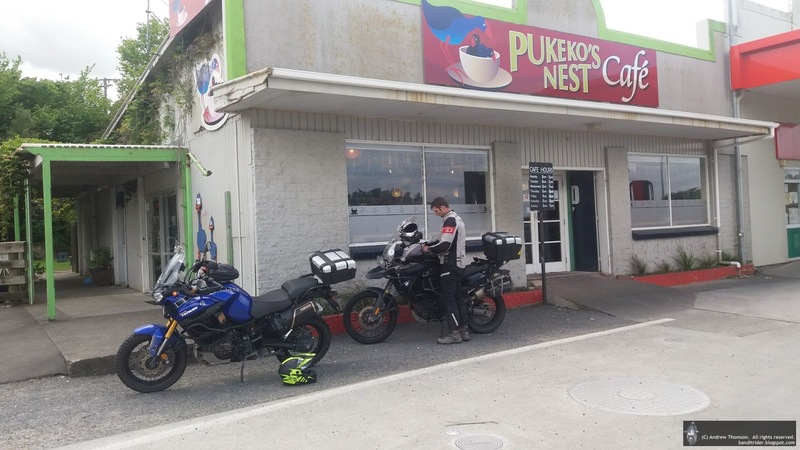 And the Tenere got in a few gravel rides and got the honour of finishing off the year with a fantastic trip through Waikaremoana. Bring on more in '18! And that was pretty much it for the year. Not as much riding as I would have liked but there was definitely some quality rides ridden and fantastic places seen. TT Planning is underway and I'm looking forward to many more fun-packed miles in 2018!